When you work at an urban career center, you come into contact with many different personalities. The customers that stick in your mind are the ones who not only help themselves, but also look out for others. In other words, they help their peers without being asked. One gentleman who I speak of often in my workshops is a guy named John who worked at Brooks Automation. He was laid off and attended my workshops. He took it upon himself to create a networking group that grew in popularity, and he ran it like a pro. When he landed his next job, I was happy and sad. Happy that he landed a job; sad that the group eventually dissolved. The Outgoing (Good) — Never out of energy and always interacting with others around them, this networker is often popular and a magnet to others. People feel his energy; it gives them energy. (Don’t assume this person is an extravert; introverts can be outgoing, as well.) When he leaves the group, people take notice and wish him a good night. The Shy (Bad) — On the other hand is the shy person who comes across as a snob or aloof. He’d rather stand in a corner watching others interact. This is not his venue; he won’t stay long. (Don’t assume this person is an introvert; extraverts can be shy, as well.) When he leaves no one notices his departure. He’s a ghost. 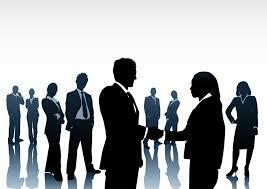 The Face-to-Face Person (Good) — She loves personal networking because she enjoys being with people. You’ll see her at every event until she’s landed a job, and she’ll return to the group to talk about her Happy Landing. She also networks in the community with whomever she can, realizing that anyone could offer her a lead. The Online Person (Bad) — Using LinkedIn exclusively is her idea of networking. She sees connecting with others and sending direct messages as the only way to network, but she’s mistaken. One must also make a personal connection to cement a relationship. The Giver (Good) — Like John, this person understands the true nature of networking. When he helps someone by providing a lead, he will get help from someone else. He creates good karma for himself. He is a maven, someone who knows about every industry and occupation, and he has contacts at many companies. The Taker (Bad) — He thinks only of himself and never of others. Just taking is a good way to alienate himself from the people with whom he networks. He doesn’t understand why people stop helping him because he’s wrapping up in his own battle. He expects people to have leads for him but doesn’t think of offering other jobseekers leads. The Listener (Good) — She is one of the favorite people in the room. Always asking questions and listening intently. She remembers previous conversations and brings them up, making people feel special. She is a great conversationalist. Unfortunately people may take advantage of her good nature and talk “at” her all night. The Talker (Bad) — This person believes that the room is his stage and those around him are receptacles for his words. People have a hard time getting away from him unless they have an escape plan. He is exhausting and gains few followers. In the community he drives people away from his company, unwilling to listen to people who could help him. The Doer (Good) — He is someone who will attend networking events despite being tired after a long day of work. The extravert and introvert alike will attend networking events, or meet up with a group of networkers, or connect with people in the community. They are active yet tactful in the way they network. The Non-Doer (Bad) — You’ll see this person at a few networking events and then he’ll drop off the face of the earth. After trying a few events and not getting immediate gratification, he’ll decide networking is not for him and abandon it. It’s a shame, as he may have potential. The Finisher (Good) — In soccer we call this a player who puts the ball across the goal line. In networking this person follows up with the people he meets at events and in the community. He keeps business cards and calls the people within 24 hours, 48 hours at the most. And he maintains contact with the people who can be of mutual assistance. The Buzz Kill (Bad) — We know what a buzz kill is. No more needs to be said. In networking he’s the person who doesn’t follow up with potential connections. Relationships die before they begin. Business cards lie in his drawer, piling up like a deck of playing cards. In contrast to John, I’ve come across networkers who are in it only for themselves. Although it’s natural to want immediate gratification, it’s far more noble and productive to help your brethren, as your efforts will be returned in due time. There are other types of networkers, such as the positive and negative attitudes. As I say in my workshops, we’re more likely to help those who appear positive than those who appear negative. They all agree. This entry was posted in Career Networking, Career Search and tagged career networking, Careers, job search, networking on May 21, 2015 by Things Career Related. I think you chose a very clever device when you made up straw people to point out negative traits to have in a job search. When you write “As I say in my workshops, we’re more likely to help those who appear positive than those who appear negative. They all agree,” I believe you cast too wide a net. Your statement may be true of the populace in general, but I find most coaches are strongly drawn to help the underdog–those most in need of help. That’s why so many of them volunteer their services, all the while knowing that they’re “competing” with themselves, and it’s very difficult to compete with free. Relatively few job seekers believe they can afford to pay for job search coaching when they’re unemployed. Even when they can, they’re too afraid to spend money they might need in the immediate future. I see your point about coaches wanting to help the underdog, but I think they need to counsel their clients to act positive in front of the general populous. It’s similar to telling them not to say, “Because I need a job” when asked why they are interested in a certain position. I agree completely. Most people are attracted to a happy, smiling face. Everyone wants to be friends with winners–the rich, the beautiful, and the famous. The same psychology makes it easier for the rich to get richer, and the already happily employed person to get an even better job. If you’re unemployed, people always worry about why.